Give your cards a distinct, luxe, and powerful makeover with textured and elegant Spot UV Business Cards. While plain business cards are effective as main touchpoints in meetings and networking events, these impressive cards will afford that extra character and bespoke flair to make you stand out from competition. We offer quality SPOT UV BUSINESS CARDS at truly competitive prices. NOTE: Spot UV can only be applied over a smooth Matte Laminate. VISUAL EFFECT: The highly reflective Spot UV varnish and the non-shiny, light absorbing Matte background delivers maximum contrast and creates an apparent and striking aesthetic effect. Spot UV illuminates, giving a gleaming look to whatever art element you specify on your cards. Glossing over areas can be done on one or both sides of your card. SPECIAL ARTWORK SETUP: Spot UV elements should be placed on a separate artboard in 100K/100% Black ink. If you do not have a designer on call, please contact us if you require assistance in setting this up for your order. *We do not offer this service with our textured stocks. Paper with raised patterns are not recommended for lamination and Spot UV since the final result will not look as smooth and crisp due to the paper’s uneven surface. CUSTOM SIZES: Free of charge, but online orders must be smaller than 90mm x 54mm. CUSTOM DIE CUTS: These are not available through our online system. For die cuts, rounded corners, and unusual sizes, please use our Custom Order Form. The Spot UV effect’s appeal is in its subtlety and elegance. However if you are looking to do a more extravagant effect that will truly give that bespoke flair, consider doing Spot UV with Embossing. Not only will your select and important Spot UV areas gleam in the light, it will also be pronounced as the embossing will create a three-dimensional effect. The glossed over areas will have a raised detail and will be very apparent, adding a unique and premium visual and tactile character to your cards. Classy and luxurious, Spot UV Business Cards are smart investments that transform your small business’ marketing business cards into impressive pieces of art that you can be proud to hand out. A bit more expensive that traditional business cards, this small embellishment is an investment that adds character and style to any existing business card design. Spot UV, especially if done with blind embossing, immediately transforms your card into a very bespoke, high-end marketing tool that is an easy classic touchpoint that enhances your brand image to your customers. UTILISE SPOT UV’S BESPOKE AESTHETIC VALUE: Spot UV is a specialty finish, a clear varish that is applied to specific areas of your card. To make sure the effect is eye-catching and interesting, plan your designs accordingly. If you have a vision but can’t do it on your own, hire a professional designer with good references and make sure to direct him or her to keep the design simple and impactful. Adding Spot UV (without embossing) adds charm in its subtlety and elegance. Keeping Spot UV contained in areas where there is print underneath will certainly make that print pop out—but why not consider going big! Try placing a pattern throughout the card with SPOT UV to achieve the effect of faux texture made possible by the contrast in light. Darker coloured backgrounds enhance the Spot UV effect, and a high ratio of UV versus laminate will create the greatest impact in most layouts. Instead of placing your logo on your cards, why not do a “blind” (no print, just Spot UV varnish) watermark of your logo on your cards? What this does is it creates a pattern that is invisible that only appears as the card catches light at different angles! Talk to your designer to experiment with more interesting effects. YOUR BUSINESS CARDS’ SIZE AND SHAPE. Be aware that cards larger than 90mm x 54mm will not fit in standard card holders or binders, but don’t be scared to innovate with die cut designs. SPECIAL CONSIDERATIONS FOR SPOT UV. Spot UV requires technical knowledge as setting up artwork is more complex that the standard artwork. It is recommended to have an experienced designer prepare the files for you. 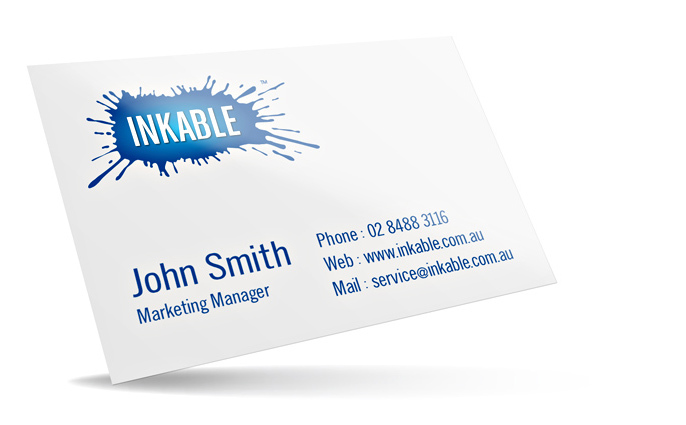 Our Prepress Team at Inkable can also help you set up your Spot UV artboard if you are printing your cards with us. Please contact us (CONTACT US LINK) if you require assistance in setting this up for your Spot UV business cards. Spot UV is a liquid varnish that goes on top of your printed cards. As it is a coating and is not really a printed element, it is not as crisp and can’t go down in scale as much as CMYK prints. Fine Text and Detail: Spot varnishing is another step in the production process, and with any elements (lines, text) thinner than 0.25pt it can be slightly offset with the printed elements. Spot UV Text (Blind): Spot UV layers with text that do not have any CMYK print registered to it are called Blind Spot UV Text. Keep in mind that to be able to decipher the writing with only Spot UV, your audience would need to catch the light. Text content may not be readable or legible at all angles. While it may seem mysterious and stylish, never do this with important details such as contact numbers and website information. Hand out cards to targeted people; and if you are amongst colleagues, hand out two at a time after a good discussion so people can recommend you easily to friends or business associates. Attach a Spot UV business card to every sales kit you sell, especially if you are looking at chasing repeat sales from certain companies.